Corrig is one of the four hills in the so called ‘Circuit of Kilbride’. Kilbride Rifle Range is an Army range on the Dublin/Wicklow border and it is nestled in a valley surrounded by Seahan, Corrig, Seefingan and Seefin. These four summits mark the boundary of the Rifle Range, and the little boundary blocks are present on Corrig. Corrig is unlikely to be climbed by itself, and is usually reached after climbing other hills first. A minor road leads from Bohernabreena in Dublin past the entrance to the Range. Corrig can be reached from this road at O073200 A. The road reaches about 480 metres altitude, taking much of the climb out of the walk. Corrig can then be reached by first climbing Seahan. Corrig can be described as the poor neighbour out of these four Kilbride hills. It is the only one without a megalithic tomb, and it is a really featureless summit. However there are also good views towards Dublin and across to Seefingan and Seefin. 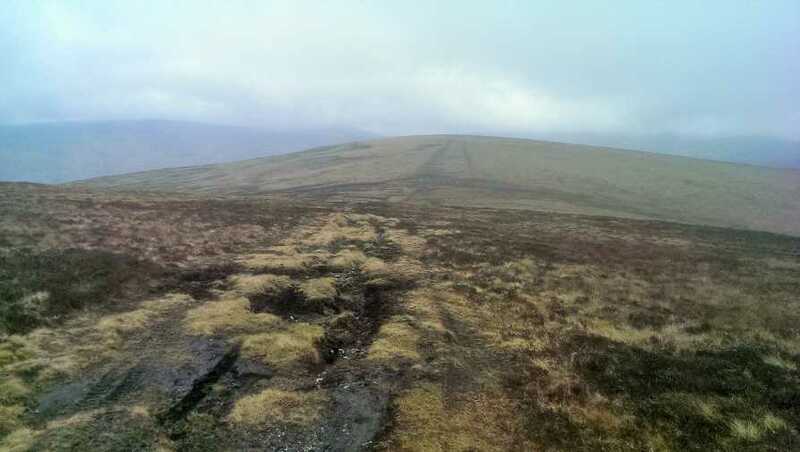 Corrig also towers above the valley of Glenasmole to the east, which was a favourite hunting ground of the Fianna. Fionn McCumhaill’s Stone in Glenasmole was said to have been carried down from Corrig by Fionn himself.